Now we’re going to move this blog party to my home: Hyannis. I love Hyannis. I live here, work here, my kid goes to school here. The natural beauty of Cape Cod, and so much to do! You know that song Rock and Roll Band by Boston? “Dancin’ in the streets of Hyannis…” I get so excited when I hear that song, because their experience was so memorable, they want to tell the world! I want to tell the world (you) about Hyannis and the things I love and experience every day. So, where do you stay? My house? Sorry, not my house. Too small. But you can stay close to my work. 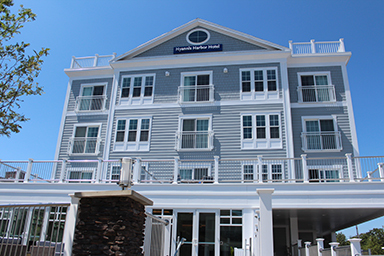 The Hyannis Harbor Hotel is located on Ocean Street in Hyannis, directly across from our Island Ferry terminal. Part of the Newport Hotel Group, this hotel has everything you need to relax and have fun with family and friends (even local ones you invite over for a dip and/or sip). Overlooking Hyannis Harbor, you can walk to our ferries to Nantucket and Martha’s Vineyard, Ocean Street and Main Street restaurants, attractions and shopping. You are also within walking distance to Veterans and Kalmus beaches. Insider tip: if you can leave your car and walk to everything you need downtown, it’s THE BOMB. 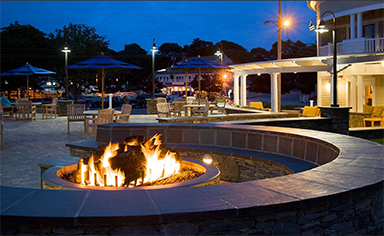 The Hyannis Harbor Hotel has top-notch amenities: free wi-fi, meeting space, fitness center, indoor pool, hot tub, outdoor pool, sundeck, patio and fire pit – my fave! There’s no need to go far for a terrific dining experience either. The Bluewater Grille is their harborside restaurant and bar specializing in delicious food and a relaxed, fun atmosphere. All of their 136 rooms have been completely renovated this year and the new building adds 62 brand new guest rooms and 6 new suites. Sweet! 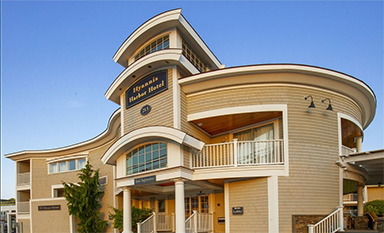 Want to stay and have a BLAST at the Hyannis Harbor Hotel? Enter to win our social media contest and select the Hyannis Getaway, which includes an overnight stay!